NOTICE: Requires the base game BioShock Infinite in order to play. Activation key must be used on a valid Steam account, requires internet connection. This content is part of the Season Pass and will be available to Season Pass purchasers in game.ABOUT THE GAMESee the world through Elizabeth’s eyes in BioShock Infinite: Burial at Sea – Episode Two. 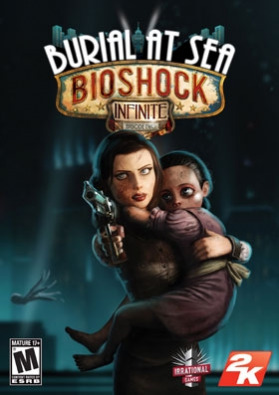 Set immediately after the conclusion of BioS… hock Infinite: Burial at Sea – Episode One, this concluding episode puts you in the role of Elizabeth as she journeys through Rapture in an effort to rescue the little sister she abandoned. Developed by Irrational Games, the studio behind the original BioShock and BioShock Infinite, this continuation of the Burial at Sea saga features parts of Rapture you’ve never seen before, built almost entirely from scratch in the BioShock Infinite engine. Explore the city and engage in a story that involves nearly every major character from the original BioShock and BioShock Infinite. Experience modified stealth-oriented gameplay that brings you new weapons and plasmids, as well as some old favorites. BioShock Infinite: Burial at Sea – Episode Two is the last of three BioShock Infinite add-on packs and it concludes the storyline of BioShock Infinite and Burial at Sea. This pack is included in the BioShock Infinite Season Pass and will contain new Achievements.SYSTEM REQUIREMENTS Minimum: Operating system: Windows Vista Service Pack 2 32-bit Processor: Intel Core 2 DUO 2.4 GHz / AMD Athlon X2 2.7 GHz Memory: 2GB Hard disk space: 20 GB free Video Card: DirectX10 Compatible ATI Radeon HD 3870 / NVIDIA 8800 GT / Intel HD 3000 Integrated Graphics Video Card Memory: 512 MB Sound: DirectX CompatibleRecommended: Operating system: Windows 7 Service Pack 1 64-bit / Windows 8 Processor: Quad Core Processor Memory: 4GB Hard disk space: 30 GB free Video Card: DirectX11 Compatible, AMD Radeon HD 6950 / NVIDIA GeForce GTX 560 Video Card Memory: 1024 MB Sound: DirectX Compatible © 2002-2013 Take-Two Interactive Software, Inc. Take-Two Interactive Software, Inc., 2K, 2K Games, Irrational Games, BioShock, and BioShock Infinite, and their respective logos are trademarks of Take-Two Interactive Software, Inc. All other marks are property of their respective owners. All Rights Reserved.The content of this videogame is fictional and is not intended to represent or depict an actual record of the events, persons, locations, or entities in the game’s setting. The makers and publishers of this videogame do not in any way endorse, condone, or encourage engaging in any conduct depicted in this videogame.